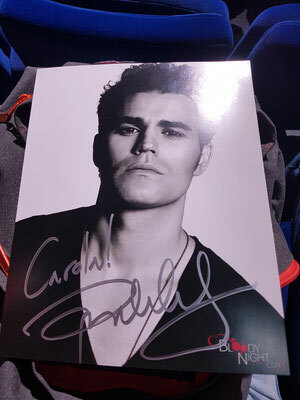 We met Paul Wesley! Liv and I are big fans of The Vampire Diaries. We haven't been watching the show for years, No, we only started watching last year. We did a lot binge watching and we finalized watching all seasons within a year. Yeah, that's dedication, isn't it? Yup, that dedication led to a lot of sleep loss. I even dreamt about the life in Mystic Falls and being a vampire myself at some point. After seeing so much Vampire Diaries on our screen, we knew we had to attend Bloody Night Con! Especially since they had announced so many awesome guests already. Like many of you, we were looking forward to meeting Ian Somerhalder a lot! In a choice between Damon and Stefan, I'll always choose Damon. It was just the first season, that I thought Elena & Stefan would be a better match. After that, it was always Damon. Yes, some of you may know I always root for the bad boy and although Damon does have a good heart, he IS a bad boy. So we both were very excited that our favorite Salvatore brother would be coming to Brussels! It's amazing to watch the series in such a short amount of time and being able to meet some of the main cast members so quickly. And then there was that day, where everyone is afraid of: The day that Ian canceled. Oh yes the horror. We were afraid of this day to come ever since we heard that his wife was pregnant. When it comes to convention I am always afraid that one of the guests cancels, but with this news we were almost sure that the day would come....and it came. Of course, we were devastated. But KLZ had some good news immediately: Paul Wesley would be his replacement. Even though I like the character of Damon more, I was happy with the replacement. He's just as a big as a guest. A great name for a con! I was very happy with Paul as the replacement guest. Although Damon is my favorite Salvatore brother and Stefan can be annoyingly good sometimes, I still like his character and I was very curious to see how Paul was like in real life. So kudos for the girls of KLZ Events for their efforts! Paul Wesley (born as Paul Wasilewski) is an American producer, actor and director. Since Bloody Night Con is a con that focuses on the Vampire Diaries and the Originals, this was the main focus. Except for these shows, you might know Paul for the Late Bloomer, Mothers & Daughters, Before I disappear, Killer Movie and more. He played 10 episodes in American Dreams, 9 in Everwood, he played the lead role in the mini series Fallen and appeared in quite some other TV series as well. I checked out Fallen before we went to Bloody Night Con. Paul Wesley plays the role of Aaron Corbett. He is a normal good hearted student, but on his 18th birthday some strange things begin to happen. One of them is the ability to speak to his dog and other animals. Aaron soons finds out that he is a Nephilim (a child of a human and an angel) and that he is the Redeemer of the prophecy. This meens he has to ability to redeem fallen angels and thus return them to heaven. Now he has to protect his family and the world from the Powers (warrior angels out to destroy him). I enjoyed watching the first installment of Fallen and I do plan to watch the second and third one. It kind of reminded me of Charmed. But of course Paul is best known for playing in The Vampire Diaries. Paul Wesley plays the role of Stefan Salvatore in The Vampire Diaries (and its spin-off The Originals). Stefan is one of the main characters of the show. He and his brother Damon (Ian Somerhalder) were born in Mystic Falls and turned into a vampire in 1864 by their love interest Katherine Pierce (Nina Dobrev). When Stefan returns to Mystic Falls he falls in love with Elana Gilbert (Nina Dobrev), who turns out to be a doppelganger of Katherine. When Damon also decides to return to Mystic Falls it turns out that the brothers aren't the best of friends. Things worsen when Damon appears to have an interest for Elena too. We already bought a photo op and autograph for Ian, so that was changed into a photo op and autograph for Paul. Online, I saw a lot of people saying that Paul Wesley was very different from Ian. Ian usually is very spontaneous. Paul was a bit reserved according to the responses. And he wouldn't do any/ a wide variety of poses. So I was curious to find out how Paul would be at Bloody Night Con! We started with attending his panels. He did 2 panels on his own, but also joined the 'Vampire Diaries Panels'. What I noticed in the panels is that he's kind and has a sense of humor. Though I also indeed saw that he was a bit reserved. Where other actors would have a huge smile and say 'I love you too' when fans would come up and say they loved them. Paul didn't seem to know how to react exactly. Or maybe he knew how to react and this was just it. It was a bit of smile followed by thanks. I can understand his response, though it was different from the other actors/ actresses. Where Riley was all happy and energetic. Paul Wesley was calm. I really loved his sense of humour and the way he acted on stage. I do think he had a hell of a jetlag. 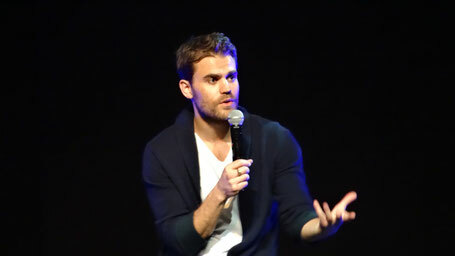 Earlier, we wrote an in depth article about Paul Wesley's panel on Saturday. You can watch the highlights video below. As you can see below, we managed to get a photo op and autograph! The queues for Paul were quite big. Everyone wanted to meet him. I was a bit nervous. Especially after reading all the experiences of others who met him. Not they sounded bad. Just different. But I do like to read all these experiences. It does give you a sense of what to expect. Even though I want to stress that everyone's experience is their own. We always write about meeting actors at comic cons, but those are our own experiences. A meeting/ photo op/ autograph can go completely different for someone else. It will always be your own experience and opinion. Exactly, always keep in mind that actors are just humans too and although it is their work to be at conventions and meet the fans, they can have a bad moment. So we queued for Paul and I did already decide to not ask for a pose. (Yeah, because of what I had read). I mean: If you know someone doesn't really like to go all crazy and do weird poses, then I won't ask for it. So we just did a regular pose. But doing the photo op was actually great! Yes, it went fast. There wasn't really a lot of time. 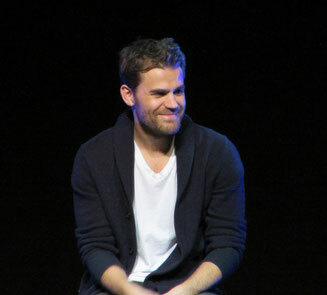 But Paul Wesley really did make it feel great. I could see he looked everyone in eye just before or after the photo op and asked how you were doing or thanked his fans. So even though it went quite fast I did feel like he was making an effort to give everyone a bit extra. It wasn't just pose, click, go. I think he did that very well. And I didn't mind doing the pose like this. 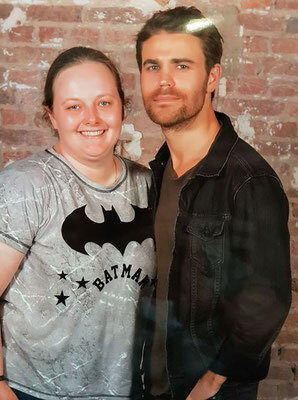 I agree, although we did feel a bit rushed during the photo op, Paul did take his time to greet you, ask for your name and he looked everyone in the eyes before doing the op. I like it when an actor does this. I can totally understand that it isn't allowed to have a 5 minute conversation during the photo op, but I do think that the people from KLZ did rush it too much during this event. You pay a lot of money to get the photo (or autograph) and it shouldn't have to feel like assembly work. 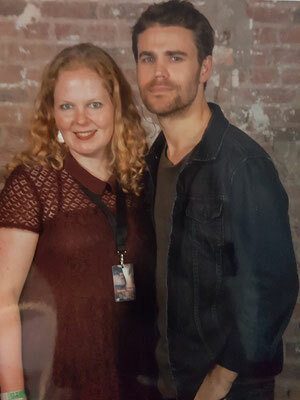 So thank you Paul Wesley for taking your time to greet us and make the moment special. For the autograph it's the same. There wasn't really a lot of item to talk. There was a long queue. It felt a bit rushed for me. But not because of Paul Wesley. It was because of how everything was set up. The staff was very efficient. Maybe a bit too much haha. It just felt a bit like a routine and just queue, give your name, get your autograph and go. But Paul again, made the effort to look around, thank people and personalize the signature. So all in all, I'm very happy with my autograph and photo op. Though I had expected a bit more of time & space at this particular con. 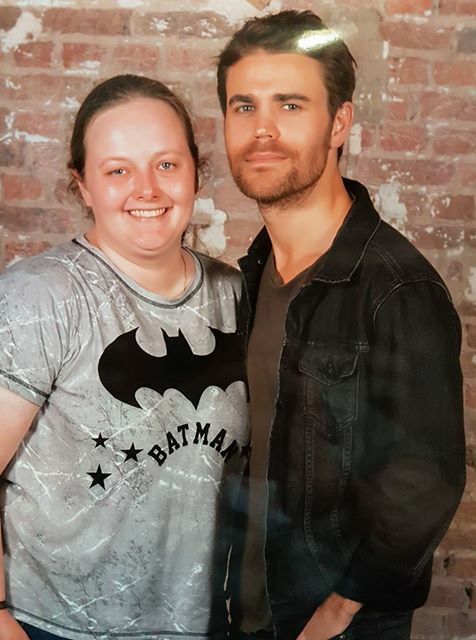 Paul Has been an great actor, you are so lucky to meet him like this is really rare to meet celebrities btw I'm looking forward for Bloody Night Con !